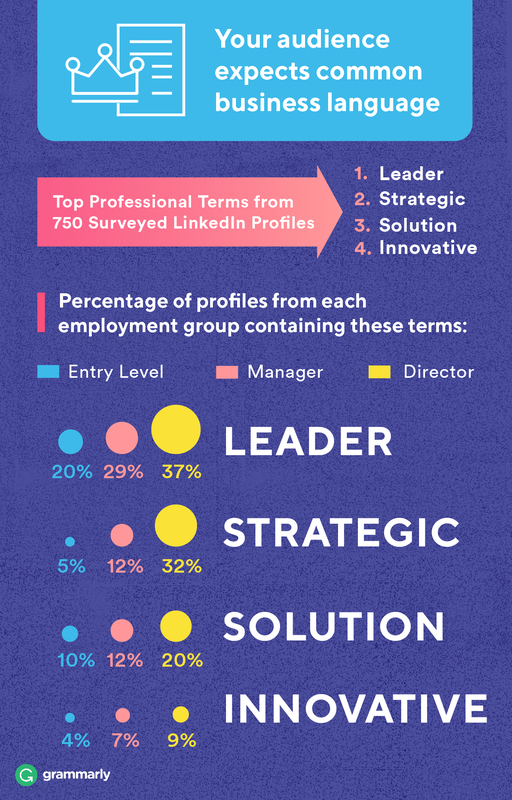 We Studied 750 Top LinkedIn Profiles. Here’s How to Write Yours Better. Your LinkedIn profile is likely among the top—and thus most clicked—results if someone happens to Google you. And a well-curated LinkedIn summary can offer them a wealth of information about your professional background. So whether you’re just quietly cruising through options or firing off applications like it’s your other job, you want your profile to shine. Maybe you’ve already done the obvious, making hundreds of connections and racking up tons of endorsements. But there are still all these boxes where your writing is supposed to go, and you’re never quite sure what to say. What words would a radiant master of LinkedIn put here, you wonder. We have an answer for you. We’ve been studying this question by analyzing the language on hundreds of top-tier LinkedIn profiles. We looked for patterns and trends to better inform what works—what can enhance your reputation and advance your career. In the end, we culled data from 750 profiles of employees at Fortune 500 companies, including entry-level workers, managers, and directors. From this, we distilled four key findings. 1 Employees—especially entry-level workers—could often say more about themselves up top. Filling out your profile summary matters, but only 42 percent of the entry-level employees we analyzed seemed to bother. Managers and directors both did so a bit more often—closer to half in our study. The top of your LinkedIn profile is an opportunity to summarize what you’re about—to make an impression beyond the array of jobs you’ve held. You might try thinking of it as an opportunity to answer the question, What makes me an outstanding candidate for my next career move? Communicating as much may sound daunting, but it doesn’t have to be an epic undertaking; the folks who filled out their profile summary in our analysis averaged between 70 and 100 words. Also, as LinkedIn itself notes, while this field allows up to 2,000 characters, it will only display the first two lines before readers have to click to see more. This isn’t the place to save the best for last, so be sure to showcase your strongest attributes and achievements in the first sentence or two. 2 Speak the language: Directors used more business terms. While we’ve noted before that this can cause trouble when you’re trying to reach a broader audience that’s not on the same wavelength, it’s a practical inevitability among a group of people all working in the same field. On LinkedIn, using these words might just signal to peers, Hey friends, I’m one of you. 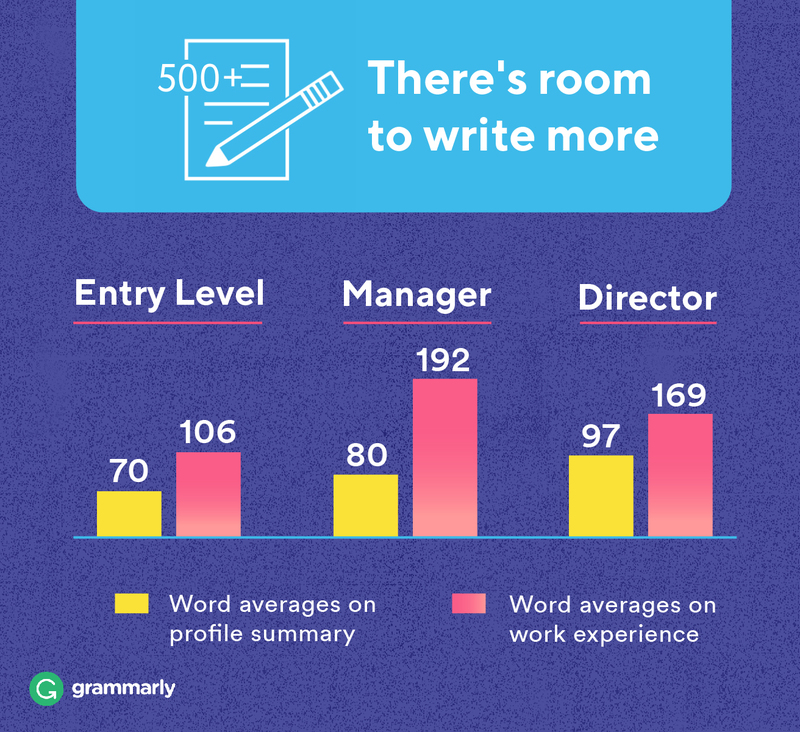 Comparing against a list of 100 of the most common such terms, we found that directors used more than three times as much industry parlance as entry-level workers. Managers, perhaps fittingly, were in the middle. The single most-used example, which led across all three levels of experience, was the word “leader.” If you’re curious, tab over to your profile now and see if you spot any from our overall top five: leader, strategic, solution, innovative, ROI. 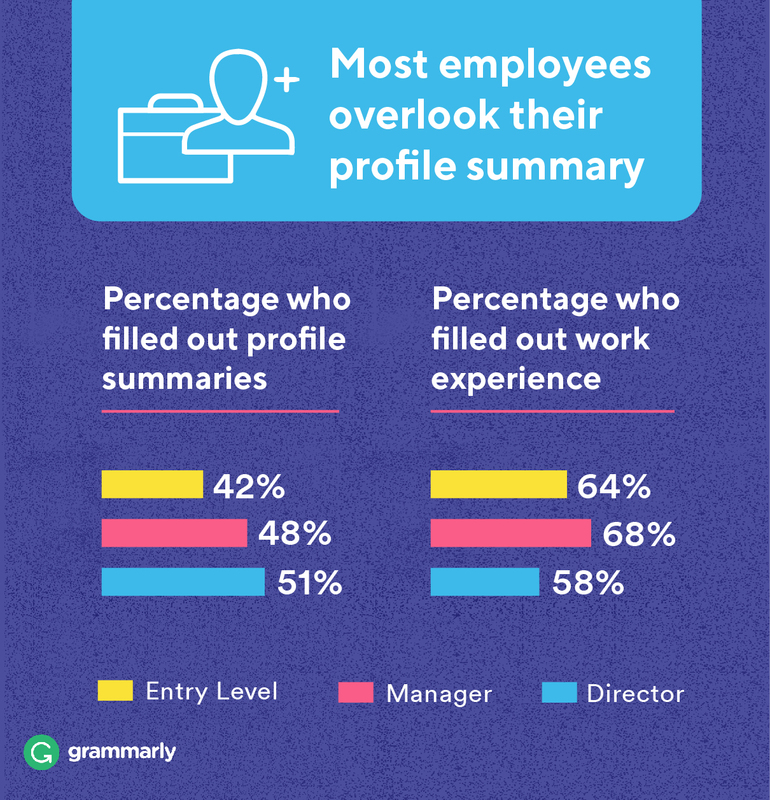 Notably, entry-level employees also often sought to portray themselves as proactive in their profile summaries, while the word dynamic was a standout word among managers in our study. Directors, perhaps tasked with the most budgetary responsibility, particularly emphasized ROI. 3 Is your LinkedIn profile saying too much, or just enough? Our analysis found that the higher up you go in a company, the longer your job title tends to become. Where the typical entry-level worker we studied has around three words in their job title, managers had four and directors had six. This pattern held true across the hundreds of profile summaries we analyzed. While entry-level employees who filled in this field offered an average of 70 words in their profile summary, managers put down 80 and directors piled on 97. But that trend was not the case further down the page, where managers led with a striking 192 words on each entry for work experience. Directors were in roughly the same ballpark with 169, but entry-level workers lagged markedly, totaling a mere 106 on average. What accounts for this discrepancy isn’t certain, but the takeaway for neophytes is evident: There’s likely room to talk a bit more about what you’ve done. For her part, Ritter urges recent graduates to talk about their accomplishments: “If you’re a recent graduate, keep your relevant internship and college leadership roles on your LinkedIn page,” she says. Such credentials are worth hanging onto until you’re at least two jobs into your career. One other thing to note as you tab over to your LinkedIn account and consider your profile title: does it look a little short, or perhaps overlong? We found the typical profile title is around six words—or seven, if you’re a director. 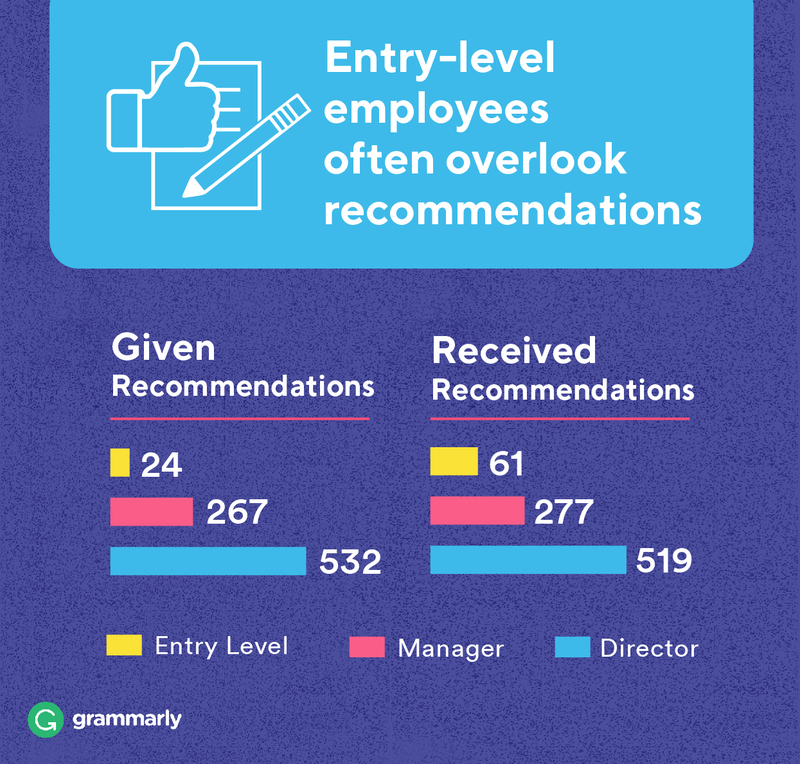 4 Entry-level employees don’t use LinkedIn for recommendations as much as they could. Here, the trend is stark: people with entry-level jobs received scant recommendations on LinkedIn, and they gave even fewer. While entry-level employees in our study received some 61 recommendations in total, managers outpaced them fourfold, with 277. Directors nearly doubled that figure again, with 519 recommendations received. The pattern was even more prominent when it came to giving recommendations. While the newcomers we looked at gave just 24, managers tallied more than ten times as many, with 267. Among directors, the disparity was more than twenty-fold; they gave a total of 532 recommendations. It’s worth noting here that across experience levels, the more recommendations a LinkedIn user gives, the more they tend to receive. If you’re looking to up your count, there are worse strategies than to simply mash out a few recommendations of your own for deserving colleagues, then see who returns the favor. Alternatively, you could also just reach out and ask a couple of people. If you go that route, try a polite email instead of a request sent through LinkedIn, so it’s harder to miss. What it takes to make a solid impression with a recruiter or potential future colleague shouldn’t be a mystery. Grammarly is here to help you look sharp as you make your way forward. 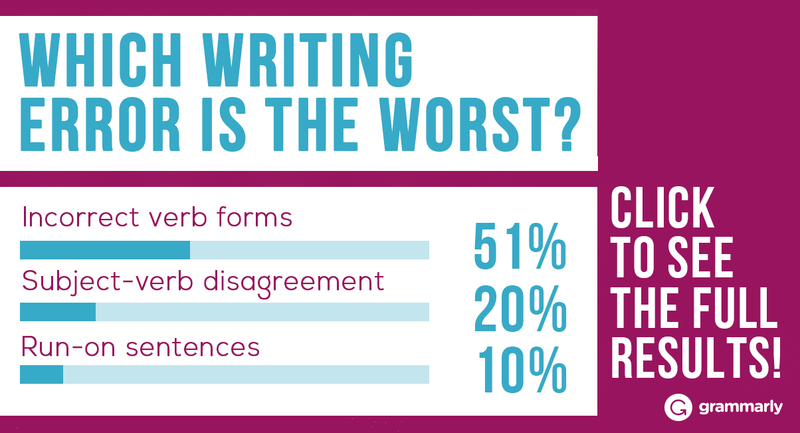 TrendsWorkplace Communication: It's Time to Write Better on Mobile WritingTop 5 Most Frustrating Writing Mistakes (and How to Avoid Them) ResearchAnd the Oscar for Best Grammar Goes to. . . WritingThe Early Bird Catches the Word: Analysis Shows We Write Better by Day GrammarPresident Obama and Comedians Dominate Top 5 for Grammar on Twitter, Grammarly Research Finds WritingWhat makes up a grammar lover? We studied our Grammarly community and here's what we found.